Confession: I am a huge fan of reality TV. More specifically, I am a huge fan of reality TV that airs on Bravo. There are certain shows that I DVR religiously – Flipping Out and the Rachel Zoe Project – and others that I watch anytime I see that they are on. It’s fun, mindless entertainment, and I spend a lot of time being really annoyed that the Real Housewives of [Insert City] are neither housewives nor real. I’m deep, y’all. I love my two favorite Bravo shows because they have taught me things. Watching Rachel Zoe, I’ve learned a lot about style and fashion, although I am unable to apply it to myself (that’s a story for a different day). Flipping Out with Jeff Lewis has helped me to develop an appreciation for modern styling and what it’s like to work with contractors. Add those take aways in with Jeff alternating between being the fun boss and yelling at staff members for the smallest of transgressions, and you have the recipe for my favorite show on Bravo. And now, we can also add in that my new BFF is the designer extraordinaire and star of the show. 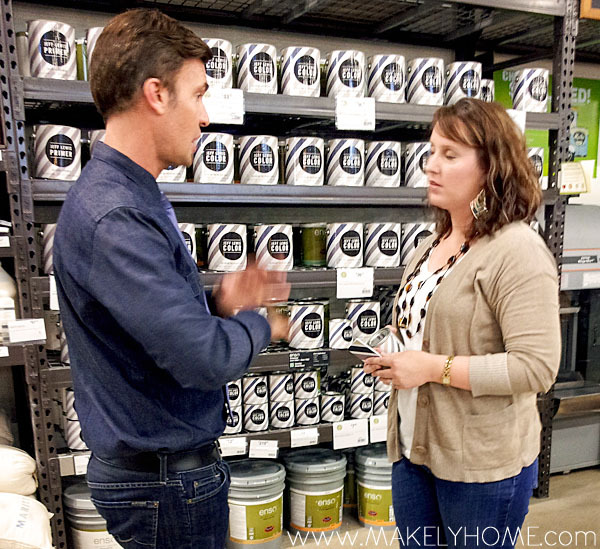 Jeff was in Austin last week for the launch of his new paint line – Jeff Lewis Color. The one thing I don’t dig about Jeff is his adherence to strictly neutral paint colors in his design work. Everything is just so white, gray, beige, greige, ugh. He’ll occasionally mix in an interesting wallpaper or an unexpected pattern, but you can usually count on a very “clean” feeling interior from him. He’s like the anti-Lindsay. 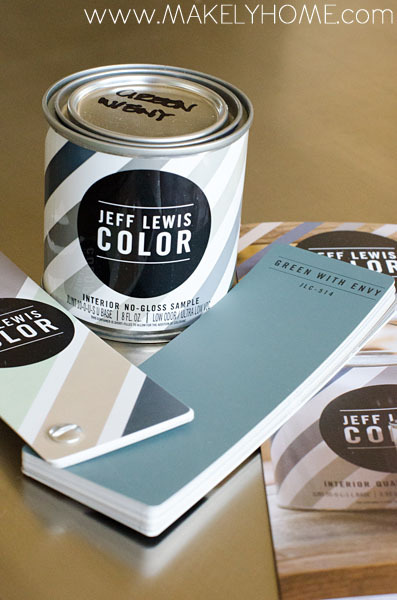 As you would expect, Jeff Lewis Color isn’t very colorful. But, the variations in the neutrals that he has selected for his line are very beautiful. Along with the whites and grays, there are some shades of blue and green. My favorite – and boldest of the fan deck – is called Green with Envy. It’s still not as saturated as anything I’d ever pick out on my own, but I got a sample can of it to see if I could work it in somewhere in my home. Lindsay: Oh, you should use it! It’s a great color. I will be your guinea pig and try it out. Jeff: Will you send me pictures of what you do so that I can see it? After I picked up my jaw off the floor, I said that I would of course send him pictures. 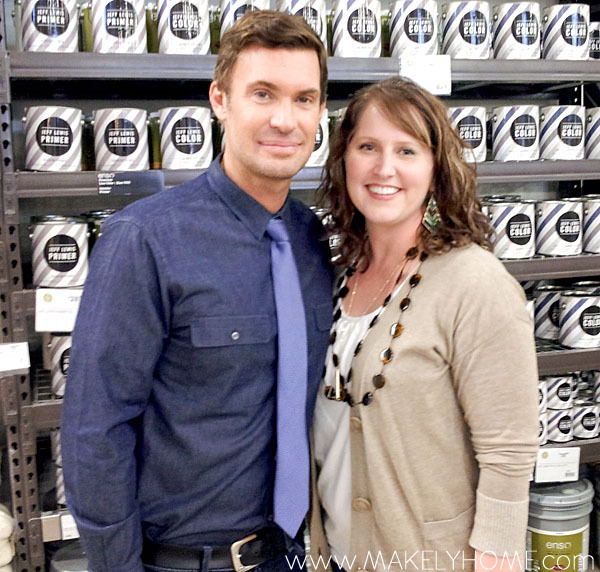 Everyone who I’ve told that I met Jeff Lewis wants to know one thing – was he mean to me? Ha! No, not at all. In fact, I found him to be one of the most personable and charming people I have ever met. When he was talking to me, it was as if I was the only person in the room. He had a warm smile, looked me in the eye, and spoke in detail. I have no doubt that he can “flip out” – hey, most of us can – but I think his on camera persona isn’t a true reflection of him as a person. He even humored my inner fan girl who asked him to sign my paint can and fan deck. And while I was walking away, he called out, “Really! Don’t forget to send me pictures.” I die. Jeff’s business manager and partner, Gage Edwards, was also there. He was EXACTLY how he is portrayed on the show. He dished a little Bravo gossip and was generally delightful with a pretty dry sense of humor. Here he is with myself and my blogging friend Jamie from C.R.A.F.T. I met some fun people waiting in line to see Jeff, including adorable personal stylist Shelly Riley. Jaime and I went out to dinner afterwards and bonded over some big laughs. It was a fun evening indeed. 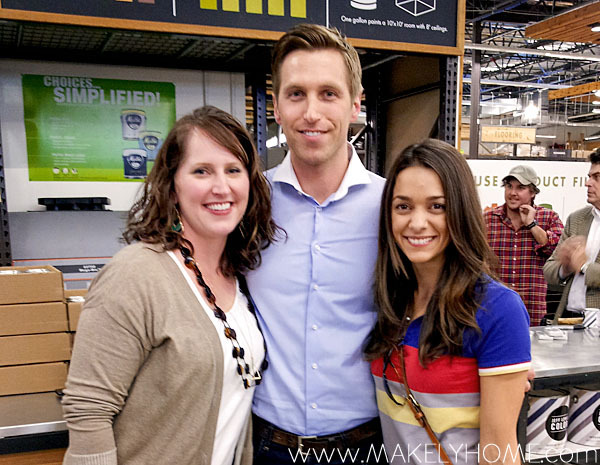 Thanks to Treehouse, our local and awesome sustainable home improvement store, for hosting Jeff! Now that I can control my excitement, I need to figure out what to paint Green with Envy. Talk about pressure! I’m considering redoing this old chair that has taken a beating. Or maybe something else will come along that will be the right piece. Any suggestions? OK, you have a sustainable home improvement store?! I have got to go there next time I am in town! I love, love a neutral paint color. I love Jeff and his antics and never completely believed the persona on the show. I mean, look how sweet he is to his grandmother. I am so glad you had a great evening and now I am getting to meet Jamie and she’s a doll too! Can’t wait to see you both in April…woot! woot! We do, Lisa! It was my first time there and it’s really neat. SO excited about April!!! LOL! It was so much fun. I’ll definitely keep y’all updated! Lucky! Oh, I am Green With Envy! I love him and his show AND his new paint line! Can’t wait to see what you do with it. 🙂 Yeah, I was very relieved to find out he was so nice. I don’t think your the only one who is addicted to reality shows. Thanks for sharing though, it’s great to see you got to meet your reality crush. I love it Lindsay! I re-posted the blog post to my SHELL facebook page. I can’t wait to see what you do with the paint and what pictures you send him! I think it would be fun to pin stripe a accent wall! I absolutely LOVE Jeff and my dear hubs humors me and watches with me once in a while! What a sweet husband! Mine watches, too. He acts like he doesn’t want to, but he gets totally into it. I can’t wait to hear how the paint is!!! PS don’t you think Andy Cohen has one of the best jobs ever?! I love Bravo reality TV too and I love Jeff and his colors for some of my paintwork. I personally prefer more vibrant colors in my home. I am very interested to see what you come up with with Jeff’s paint sample!! Oh my! I adore Jeff! You are so lucky! I am also the opposite of neutral but loves everything Jeff does. Can’t wait to see what you do and how Jeff responds. I’ve been WAITING for someone to ask this, so you win the prize! LOL I was definitely hoping to see one of THOSE color names, because I’m apparently a 15 year old boy. HAHA! But no, the colors are all tame. I love the desk redo….and am excited to see more of your furniture redos. Three of the four links you have at the top of your furniture page are for pages that are no longer available. Have those pages been removed or were they moved and so those links are just broken? Don’t want to miss any great ideas! I love Green With Envy too. Please do post photos. I want to do my living/media room in either it or F&B Card Room Green. I’m sure lighting a room painted that dark will be a challenge. Great ideas and a very nice job!